Kimberly Parillo is a graduate of the Peabody Conservatory of Music, where she completed her Master of Music degree, studying with Ira Gold (National Symphony Orchestra). Prior to her work at Peabody, Kim graduated with a Bachelor of Music degree from George Mason University in Fairfax, Virginia, where she studied with Glenn Dewey ("President's Own" U.S. Marine Band). 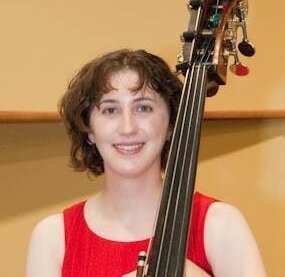 Kim has been teaching double bass since 2007 through her private studio, originally in Fairfax, Virginia, but now based out of central Maryland. She has also been Adjunct Double Bass Faculty at Washington Adventist University since Fall of 2015. Kim regularly performs with a number of ensembles in the area. She is a section bass member of the Maryland Symphony, and also frequently plays with other orchestras, including the Annapolis Symphony, the Alexandria Symphony, the American Festival Pops Orchestra, and a wide variety of other groups.